$120.00 Medal for the Defense of Stalingrad, Variation 1, 1940s. In outstanding condition and includes original suspension with old ribbon. This is one of the best examples of Stalingrad Medal we've had in recent years. 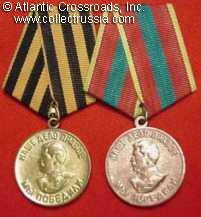 $80.00 Medal for the Defense of Stalingrad, Var. 1, 1940s. In very fine condition. Includes original wartime suspension. $95.00 Medal for the Defense of Stalingrad, Var. 2 ("Voenkomat" post-war issue), in superb condition. Includes original suspension in brass. $150.00 Award Document for a Defense of Stalingrad Medal, awarded in July 1943 to a female Captain in a fighter air regiment. The recipient was in charge of the Chemical Warfare department of the regiment and was also involved with "operational work". A highly unusual early issue to a female combatant! $125.00 Award Document for a Defense of Stalingrad Medal, October 1943 issue to a Private in a tank brigade. His unit was a part of the mobile armored force that seized Kalach-on-Don and sealed the fate of the German 6th Army in Stalingrad. $75.00 Award Document for a Defense of Stalingrad Medal, November 1945 issue to a railroad construction engineer. $55.00 Medal for the Defense of Leningrad, Var. 1 (with separate eyelet), 1940s issue. A superb example on original WW2 brass suspension. $95.00 Award Document for a Defense of Leningrad Medal, April 1944 issue to a Red Army or NKVD major. In outstanding, excellent condition. $110.00 Medal for the Defense of Moscow, Var. 1, 1940s. A superb example - among of the best we have seen in years and practically impossible to upgrade for condition. Comes on original suspension with immaculately clean old ribbon. $80.00 Medal for the Defense of Moscow, Var. 1, 1940s. In very fine to excellent condition. An attractive example with a lot of character but free of significant wear or damage. Comes on original suspension with old ribbon. $25.00 Medal for the Defense of Moscow, Var. 2 ("Voenkomat" post- war issue), circa 1970s-80s. Near Mint condition. $75.00 Award Document for a Defense of Moscow Medal, October 1944 issue to a serviceman of 319th Rifle Division. An early type certificate on printed on thinner, glossier paper. In very good condition. $80.00 Document for Defense of Kiev Medal, May 1962 to a Georgian national. In excellent condition. $55.00 Document for Defense of Kiev Medal, 9 May 1962 "Victory Day" issue. In fair to good condition. $95.00 Medal for the Defense of Caucasus, Var. 1 (separate ring), scarce early version featuring tank-borne soldiers carrying rifles, mid 1940s issue. In very fine to excellent condition. $65.00 Medal for the Defense of Caucasus, Variation 1 (separate ring), 1940s issue. In superb condition - one of the best examples we've had in years. Comes on original suspension with beautifully preserved old ribbon. $50.00 Medal for the Defense of Caucasus, Var. 1, 1940s issue. In very fine to excellent condition, an attractive piece on original suspension. $70.00 Medal for the Defense of Caucasus, Var. 2 (U-shaped ring), late 1940s - early 50s. This version of the Caucasus medal is harder to find than either the wartime Var. 1 or even the relatively scarce "Voenkomat" Var. 3. In superb condition. $45.00 Medal for the Defense of Caucasus, Var. 3, circa 1960s-80s. Relatively uncommon "Voenkomat" version in outstanding condition. $125.00 Medal for the Defense of Soviet Polar Region, Var. 2 (U-shaped ring), circa 1940s-early 50s. In outstanding condition - literally impossible to upgrade. $120.00 Medal for the Defense of Soviet Polar Region, Var. 3, circa 1960s. Very uncommon, early Voenkomat version with Raised Border along the edge on the reverse and "LMD" mint mark to the eyelet. In outstanding condition. $120.00 Award Document for a Defense of Polar Region Medal, awarded to a Sgt. Major serving with the Reconnaissance Department of the HQ, Maritime Group of Soviet Troops (in the Far East). Hand- signed by the department commander who would later become a GRU General. The document was issued on 30 July 1945 issue, just days before the planned Soviet attack on Japan. An early type certificate printed on paper of thinner, glossier stock. In good to very good condition. $80.00 Document for a Defense of Polar Region Medal, April 1946 issue to an enlisted naval artilleryman, Northern Fleet. In excellent condition. $590.00 Medal for the Defense of Odessa, Var. 1, 1940s. In very fine to excellent condition, with beautifully preserved, crisp details. Comes on original wartime suspension and old ribbon. With some 30,000 ever awarded, an Odessa Medal in such a premium condition is a rare find indeed. $380.00 Medal for the Defense of Odessa, Var. 2 ("Voenkomat" post-war issue), circa 1960s-70s. Superb specimen in near mint condition. $450.00 Document for Defense of Odessa Medal, extremely early, July 1843 issue to a Torpedo Boat officer of the Black Sea Fleet. Hand-signed by the Commander of the 1st Torpedo Boat Brigade Filippov, who was later promoted to Rear Admiral and awarded with Order of Ushakov (at 34, he had the distinction of being the youngest admiral in the Soviet Navy). The document is in very good to excellent condition. $375.00 Document for a Medal for the Defense of Odessa, awarded in September 1944 to a Sergeant Major. The recipient was studying at an officer school at the time, but the available archival document shows that he took part in the defense of Odessa as a reconnaissance squad leader. His regiment was successfully evacuated from Odessa at the end of the siege. Later that year, it took part in the amphibious landing in Crimea and in 1942-43, in the battle of Stalingrad (as part of the 64th Army). The document is good condition. Comes with a copy of the award decree for the Defense of Odessa Medal. $350.00 Medal for the Defense of Sevastopol, Variation 1, 1940s issue. An outstanding example. $225.00 Medal for the Defense of Sevastopol, Var. 2, circa 1960s-70s issue. A relatively early post-war "Voenkomat" version in very fine to excellent condition. $270.00 Document for Defense of Sevastopol Medal, awarded in July 1943 to a Senior NCO of the Reconnaissance Section, Black Sea Fleet. Hand-signed by the department commander. Note the extremely early issue date. The document is in very good condition. $280.00 Award Document for a Medal for the Defense of Sevastopol, a very early, October 1943 issue to an enlisted naval infantryman of the Black Sea Fleet. The recipient was later awarded with a Medal for Valor for his brave actions during the famous Eltigen naval assault and the desperate battle in the city of Kerch in November - December 1943. The document is in good condition. Comes with a photocopy of the award commendation for the Valor Medal from the Russian military archives. $55.00 Medal for the Capture of Berlin, Var. 1, circa 1945-47 issue. In excellent condition. $45.00 Medal for the Capture of Berlin, Var. 2, late 1940s-early 50s. Uncommon version with circular rather than U-shaped eyelet. Attractive example in very fine to excellent overall condition. $50.00 Document for a Capture of Berlin Medal, a very early, October 1945 issue to a Guards Sergeant. In very good to excellent condition, much better than the average. $60.00 Medal for the Capture of Koenigsberg, Var. 1, circa 1945-47. In very fine to excellent condition, an attractive example free of any significant flaws. Comes on a brass suspension. $45.00 Medal for the Capture of Koenigsberg, Var. 2, 1940s-early 50s. Uncommon version with circular rather than U-shaped eyelet. In very fine to excellent condition. $40.00 Document for Capture of Koenigsberg Medal, March 1948 issue to a Private. In very good condition. $70.00 Medal for the Capture of Budapest, Var. 1, circa 1945-47. This very attractive piece is in excellent condition. Comes on original WW2 suspension. $75.00 Document for the Capture of Budapest Medal, awarded in June 1946 to a Guards Private. In excellent condition. $70.00 Document for the Capture of Vienna Medal, issued in September 1948 to a Guards Artillery Private. In good condition. $55.00 Medal for the Liberation of Warsaw, Var. 1, circa 1945-47. In very fine to excellent condition. Comes on original suspension. $55.00 Medal for the Liberation of Warsaw, Var. 2, late 1940s-early 50s. An excellent specimen on original brass suspension. $40.00 Medal for the Liberation of Warsaw, Variation 3 ("Voenkomat"), circa 1970s- 80s issue. In excellent condition. $50.00 Document for a Liberation of Warsaw Medal, March 1946 issue to a Guards Private. In very good to excellent condition. $95.00 Group of 5 documents to a Guards Rifle lieutenant. Includes certificates for the Medals for the Liberation of Warsaw, Capture of Berlin, Victory over Germany, and two anniversary medals. A nice representative WW2 campaign group to a Russian Guards infantry officer. $60.00 Medal for the Liberation of Prague, Var. 1, late 1940s. Excellent example on original WW2 type suspension. $55.00 Medal for the Liberation of Prague, Var. 2 (U-shaped ring), 1940s-50s. A superb, impossible to upgrade example. $45.00 Medal for the Liberation of Prague, Var. 3, circa 1970s-80s issue. A relatively scarce "Voenkomat" issue in very fine to excellent condition. $75.00 Document for Liberation of Prague Medal, May 1947 issue to a Red Army Private. In excellent condition. $45.00 Document for a Liberation of Prague Medal, November 1965 issue by the military commissariat in the city of Pervouralsk. This certificate would be a perfect match with a relatively Var. 3 "Voenkomat" version of the medal. In excellent condition. $290.00 Medal for the Liberation of Belgrade, Var. 1, 1940s issue. In very fine to excellent condition. Comes on original brass suspension device with beautifully preserved old, probably original ribbon. A very attractive piece! $270.00 Medal for the Liberation of Belgrade, Var. 2 (U-shaped eyelet), late 1940s - early 50s issue. This is the most scarce version of one of the more uncommon Soviet WW2 medals. In very fine to excellent condition. $395.00 Document for a Liberation of Belgrade Medal, March 1947 issue. In excellent condition. $14.00 Medal for Victory over Germany, Var. 2, 1940s-50s. In excellent condition. Comes on original brass suspension. $30.00 Award Document for a Victory over Germany Medal, a relatively early, January 1946 issue to a Corporal in an illustrious Cannon Brigade of the 11th Artillery Division, 2nd Ukrainian Front. In excellent condition. $65.00 Medal for Victory over Japan, Var. 2, 1940s - early 50s. A superb example on original suspension. $55.00 Medal for Victory over Japan, Var. 2, 1940s - early 50s. A very fine example on original brass suspension with old ribbon. $55.00 Medal for Victory over Japan, Var. 3 ("Voenkomat" version), circa 1970s - 80s. Attractive example with bright gilt finish and crisp details, in very fine overall condition. $40.00 Document for Victory over Japan Medal, 1947 issue to a Private. In outstanding condition. $45.00 Document for Victory over Japan Medal, awarded in April 1946 to a Corporal in a Guards Infantry unit. In very good to excellent condition. $15.00 Award Document for a Medal for Meritorious Labor during the Great Patriotic War, May 1946 issue. In excellent condition. $65.00 Medal for Victory over Japan, Var. 2, circa late 1940s - early 50s issue. In excellent condition and includes original suspension in brass.